From the kitchen of One Perfect Bite...This is a nice recipe to have on hand for a family meal. It's easy to prepare and while it's great for a weeknight, it lacks the finesse needed to elevate it to company fare. 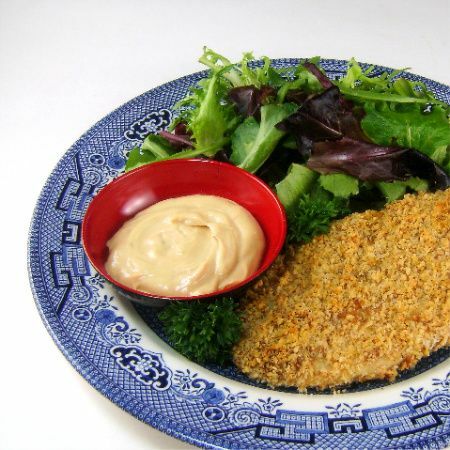 The chicken is breaded with a peanut crust and baked rather than sauteed. It's served with a sweet yogurt sauce that's flavored with peanut butter and a Vidalia onion dressing. While I prefer to make my own dressing, I've tested this recipe using one that is commercially available. The commercial variety does nicely and makes quick work of meal preparation. For those of you who are purists and prefer the "from scratch" route, I'll post my recipe for sweet onion dressing within the next few days. If you like heat, you might want to add a bit of sriracha to the finished peanut sauce which can, by the way, be made with natural peanut butter. The chicken will be more flavorful if you use salted roasted peanuts in the crumb coating. I like to serve this over lightly dressed bitter greens such as arugula or watercress. It is quite filling and you won't need a lot of sides to fill out the meal. If you're looking for a nice family meal that's a bit out of the ordinary, you like this one. Here's the recipe. 1) To prepare chicken: Preheat oven to 400 degrees. Dredge chicken strips in flour, dip in a mixture of egg white, peanut butter and Vidalia onion salad dressing, then coat with a mixture of bread crumbs, peanuts and chili powder. Place on a greased rack set over a cookie sheet and bake until cooked through 20-30 minutes. 2) To make sauce: Mix peanut butter and dressing until smooth. Stir in soy sauce, parsley and yogurt. Mix well. If very thick, thin with milk. Chill until serving time. 3) To serve: Serve with sauce on plates lined with bitter greens and topped with chicken. If desired, garnish with strands of lemon zest and parsley. Yield: 4 servings. Such an interesting idea! I'd love to try this! This looks AMAZING and not too hard -- so even I could handle it! This is a light and tasty suggestion....that sauce is probably a delicious dip! Perfectly delicious recipe. One I even think my finicky hubby will like. Thanks! Look forward to the onion dressing recipe as well. Omg, peanut crusted chicken breasts seriously makes me hungry..yumm! Looks yummy.... and so pretty also! This would add a fun new twist to a variety of salads. What a wonderful idea! And certainly a better way to use salted peanuts than simply swallowing the whole packet BEFORE the meal ;-) I love peanuts in savoury dishes, and now I know where to look for new recipes and ideas. How come I haven't discovered earlier your beautiful and inspiring blog? It's such a pleasure to read and admire... (And thank you for stopping by at mine and your kind words). What a great combination of ingredients; looks so good. Man---what an idea! You've really got the ying and the yang goin' with this dish. Wonderful! This looks so fresh, different, and tasty!! And the sause, yum!! Excellent. I love the sound of this. I'd like to try making it with pistacchios, although I wish they were less expensive. What a creative way to serve chicken breasts! Great recipe and post! Oh yum sounds really good. Norm's caregiver is working out which is good for all of us. Wow this looks absolutely DELISH! This is a must try! I seldom add peanuts to a recipe but this sounds delicious and I'm adding it to my list of must tries! Stealing this one, and will eagerly await your homemade onion sauce recipe! Thanks again. Mary, this chicken recipe looks delicious and I did see your cookie recipe below it and all I can say is WOW. That is definitely on my list for "MUST TRY". Mary, with so many people avoiding peanuts these days, I am thrilled with the peanut recipes you have been posting. This one looks particularly good to me. Thanks for sharing it. This looks great. My family would love this one! If I were your company you could certainly serve this to me! You had me at "peanut onion sauce" mmmmm I will be making this soon. Mmmmm, that looks delicious, and I love it even more that was made in the oven. Thank you very much for your comments on my blog !! Your compliments are going straight to my heart !! It is a real honor to be appreciated by an outstanding cook !! this sounds truly good..also reminds me of satay! I would love to come over for dinner and find that this was being served! Every component looks completely delicious...especially that sauce! Awards waiting 4 u pls collect them from my blog. This looks very good! I love the flavor of peanuts with chicken. Delicious! Have a great weekend! oh interesting recipe!! i've never seen a batter with both peanut butter and vidalia onion dressing and crushed peanuts too- that is creative! i bet you are right too- its probably delish but lacks finesse for company meals! wow that looks wonderful.. i've never seen a peanut crusted chicken breast. usually breadcrumbs.. very unique! OMG, what a wonderful idea, i wold love to try this simple dish. Mary, thank you so much for your kind comments on my blog. Your blog has just provided me with some lovely reading time, too. Best wishes! Using peanuts as a crust. That seems like a great idea! I love recipes like this and am always looking for new ways to cook chicken. This sounds absolutely delicious especially with the sauce! Thanks for posting! Yum! I've made something similar but with crushed pistachios and bottled sweet onion sauce. This sounds great! Can't wait to try it! The peanut crust looks delicious and paired with the sweetness of the Vidalia onion sauce sounds like a perfect combination. I've picked recipes from your blog for dinner each night this week. This recipe was outstanding!! The chicken was so crispy and crunchy with great flavor. The sauce was good too. I served with asparagus and fettucine with wild ramp pesto. Nummy! !